The ground that Santa Fe is built upon was originally inhabited by a number of Pueblo Indian villages. Many of these villages, built around 1050-1150, were abandoned 200 years before Spanish settlers arrived, leaving little modern day evidence of their existence. Despite this, the indigenous population at the time of Spanish settlement in the 17th century was approximately 100,000 people scattered throughout 70 multi-storied adobe towns known as Pueblos. Many of these surviving Pueblos are still in existence today. As was common in these times, the Spanish settlers and missionaries attempted to subjugate and conquer the Native Pueblo Indians. Ultimately, in 1680, the Pueblo’s revolted against the colonists, burning most of Santa Fe and occupying the region until 1692. One of the few buildings that survived this destruction is the Palace of the Governors; still a central part of the historic Santa Fe Plaza. 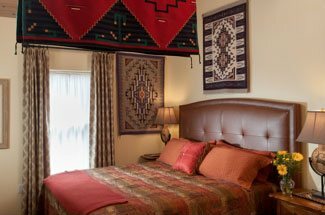 Come see all of this amazing history and more, when you stay at our luxurious Santa Fe Bed and Breakfast, located right in the heart of Santa Fe. Following these tenuous times, the Spanish Empire formed an alliance with the Pueblo Indians, generally maintaining a peaceful coexistence in the region. Despite this, though, The Spanish Empire was closed to the Pueblo’s, a policy restricting trade to only Americans, British, and French for nearly 130 years. Finally, the closed empire policy ended with Mexican rule in 1821, allowing American trappers and traders into the region. With new trade possibilities came the opening of the historic Santa Fe Trail, making Santa Fe a popular center for trade. Even today, Santa Fe still continues to give shoppers access to Native American artwork and unique handmade items. Despite Santa Fe’s sometimes violent history of conquest and frontier violence, the city has done a remarkable job of preserving its history and cultural traditions. In total, eight Northern Indian Pueblos lie in the region between Santa Fe and Colorado, mostly nestled in the majestic regional mountains. Located just 18 minutes north of Santa Fe is the Nambe Pueblo, which dates to the 1300’s, and is located in the beautiful Sangre de Cristo Mountains. The Nambe Pueblo played a pivotal role as a center for culture and religion. While visiting the Nambe Pueblo, make sure you take the time to head to Nambe Falls Recreation Area, home to a stunning double-drop waterfall, picnicking, hiking, and camping. Coming up in July is the annual Gathering of Eagles celebration at Nambe Falls. Continue a few more minutes north, and you will come to the Ohkay Owingeh Pueblo. Pope, the leader of the 1680 revolt against the Spanish, was born here. Historically, only the people of this Indian Pueblo, known for their strength, could declare war for the Pueblo Indians. Now, you’ll find that Ohkay Owingeh is home to the San Juan lakes, a popular fishing spot. Also here is the Oke Oweenge crafts cooperative, where you can buy local artisan goods. Coming up in July is the Eight Northern Indian Pueblo Arts and Crafts show. Also nearby is the San lldefonso Pueblo, which was home to the famous artist Maria Poveka Martinez who pioneered the now famous use of black on black pottery. If you’re looking for a longer day trip, head about an hour north to the Taos Pueblo. 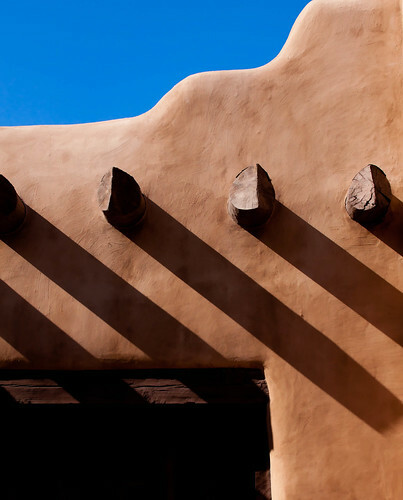 The multi-storied adobe architecture found in this Pueblo is world famous. At approximately 1000 years old, the Taos Pueblo is one of the oldest, continuously occupied villages, and is now recognized as a World Heritage Site, as well as a National Historic Site. This Pueblo once served as a major trading center, acting as the gateway to the eastern plains. We suggest taking a guided tour of the Pueblo to get the most out of your visit. When planning a trip to visit one of our local Pueblo Indian locations, pleasure be sure to follow proper Pueblo etiquette. It’s best to do your research and check their website if available, or call them ahead of time. Many Pueblos have specific visitation hours, and are often closed during rituals or on other important days. Some Pueblos do have an entrance fee or a photography fee, and in some places photography is banned completely. Cell phone use is strongly discouraged, and sometimes banned, when visiting a Pueblo. When visiting, as always remain appreciative of the history you are experiencing, and thoughtful of your surroundings so theses historic treasures can be enjoyed for centuries to come. Pueblo Indians value their rich history of traditions, customs, and religions. Therefore, it is important to remain polite and inoffensive to their way of life. If you get the privilege to witness a tribal dance or ceremony, remember that it is a sacred event, and silence is mandatory. Visiting Pueblo’s is a special experience. 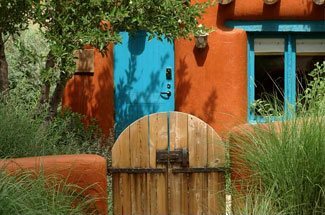 Whatever your reason to visit Santa Fe, we look forward to your stay with us, and we hope you take the time to experience the unique environment found in the villages of our Pueblo Indians.